Last Century : GAG has come. This GAG came to my home on summer 1997. Ex-owner left this GAG about two years in his garage. 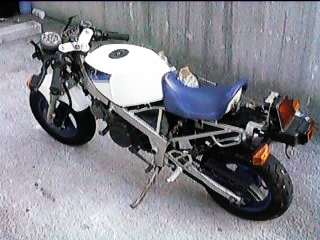 Muffler SP-TAkegawa, Fairing except under, Holed tank and more parts came with. Engine can start and run normaljy. little noise was head. But no problem I think. Ex-owner was ride this to go to his job from Futashika to Central of Iwakuni city.